Product Details- Use- enhancer to help whites to be whiter and colors brighter. Suitable- All Breeds Dogs and Cats. 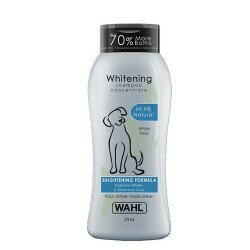 Product Information -Wahl Whitening Shampoo contains less than 1% color enhancer to help whites to be whiter and colors brighter. The rich lather deep cleans dirt and environmental residue that dulls your dogs coat. The easy rinse shampoo leaves your dogs coat clean, silky and smooth. 99.9% natural plant derived ingredients make Wahl Shampoo the choice for owners who want to avoid harsh chemicals for both their dog and themselves.